Kenwood Neighborhood, Minneapolis: The name Minneapolis is a compound word that combines the Dakota word for water (mini) with the Greek word for city (polis), so the name actually means City of Waters. In addition to the Minnesota and Mississippi rivers Minneapolis is also home to a chain of lakes that lie west and south of downtown, so the name is quite appropriate. The Kenwood neighborhood lies west and slightly to the south of downtown between two of these lakes, Lake of the Isles and Cedar Lake. 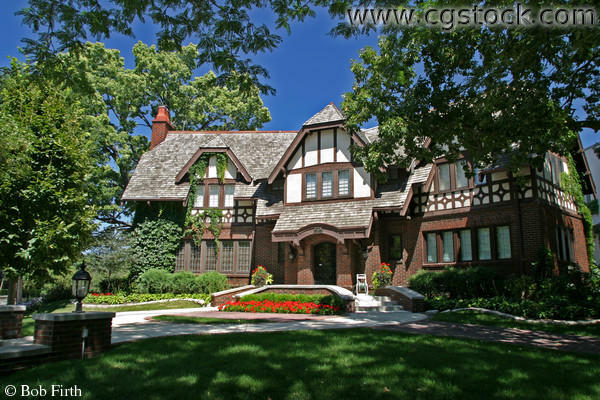 Kenwood is one of the wealthiest neighborhoods in Minneapolis, which is fitting given the Elspeth’s family is also one of the wealthiest of the Guild’s Great Families. It is, however, a newer neighborhood than Summit Avenue in Saint Paul where Elspeth’s grandfather lives, which is intended to illustrate the generation gap between the two of them. There is no “Sprengel Mansion” in Kenwood, but I imagine it might look something like the real Kenwood mansion in the photograph above. The main corridor would run through the wings on either side of the front door, with the parlor to the right of the photo and Elspeth’s study at the far left. In addition, the ballroom that serves as the temple would be most of a third wing directly across from the front door. One other reason that I have always thought of Kenwood as a neighborhood in which magicians might live is the wonderful Kenwood Water Tower shown here, which always has reminded me of some sort of fantasy-novel wizard’s tower. It would be fun to buy it and remodel it into such a place if the city were to ever sell it, especially if I could stand up on the roof and cast spells. There is a railing up there and as the water tower is on a high ridge the view from the roof would include the whole city.